“75s & 100s” are specially designed systems for the most aggressive environments. High speed and heavy duty, these systems are used, for example, within Steelworks. 75s and 100s are Pneumatic Tube Systems for aggressive environments in 75mm and 100mm tube sizes (other sizes could also be manufactured). Designed to use steel tube and high-speed carriers, 75s and 100s systems may ether use local exhausters or site compressed air as motive power. 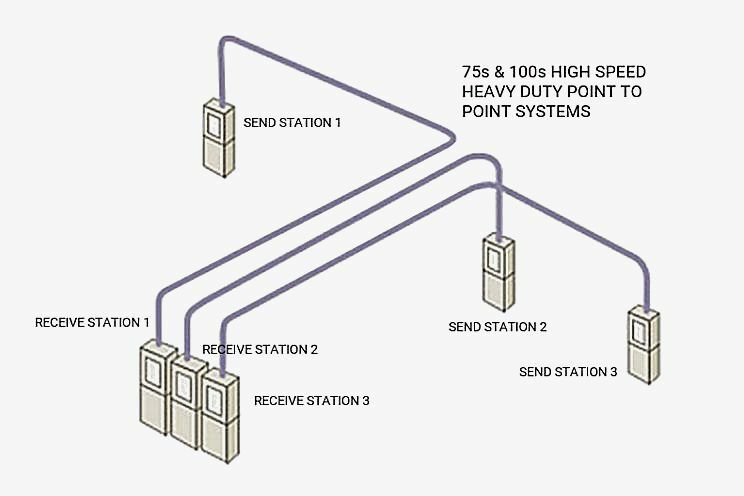 Primarily a “Point to Point” system using a discrete tube for each route, it is possible to incorporate diverters for special applications should this be required. Control systems are built to specification, and will usually be custom-built PLCs.